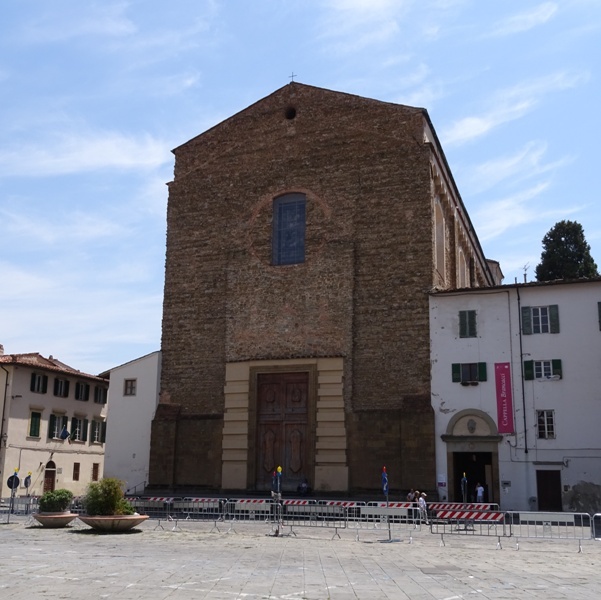 This post is about the Brancacci Chapel, a famous chapel in the church of Santa Maria del Carmine, Florence. Normally, I would write a post about the church and then add a few lines about the chapels. For the Brancacci Chapel, I am going to turn that around. This post will be mostly about the chapel, as the church is largely uninteresting, while the chapel is truly spectacular. I somehow missed the chapel on my first visit to Florence in 2010. I remember passing by the Santa Maria del Carmine, but for some reason my friend and I decided to walk on. We had not planned to visit the church and chapel anyway, and perhaps we were put off by the information in our travel guide, which stated that reservations for visiting the chapel were compulsory. I do not think they are. When we visited the chapel in June 2016, we made a reservation just to be sure, but we saw plenty of tourists simply buying a ticket at the Biglietteria. 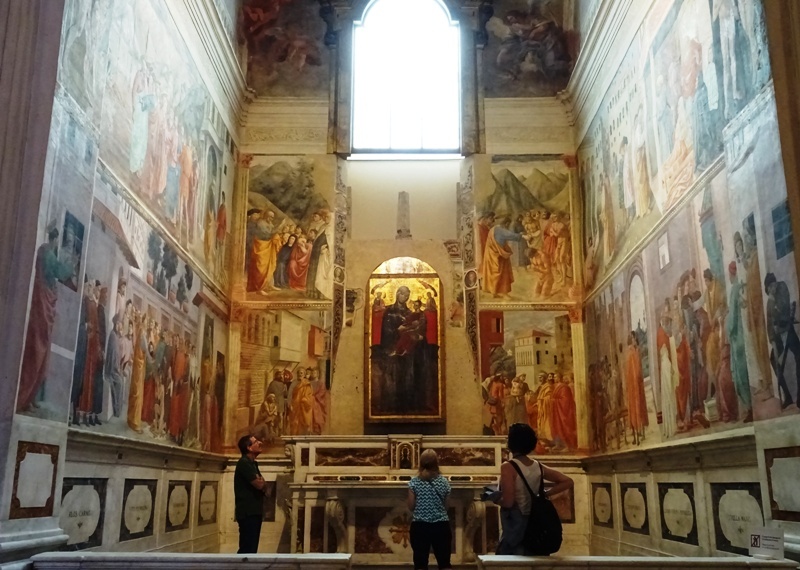 Since the chapel is quite small, the people from the Musei Civici Fiorentini only let in a limited number of visitors at the same time and visit time may be limited as well. However, when we visited the chapel in June, it was very quiet and we had all the time in the world, while the bored-looking guard was only paying attention to his smartphone. The Santa Maria del Carmine. The church of Santa Maria del Carmine dates back to 1268. It was founded by a group of friars from Pisa. Construction of the church was supported by the Florentine government and by many of the city’s noble families. The church was only consecrated in 1422 and declared completed in 1475. The Santa Maria del Carmine has always had an undecorated facade. It looks imposing, but it does not radiate any beauty. A Carmelite convent was built alongside the church in the late thirteenth century and it quickly grew in importance. The famous Carmelite friar Saint Andrea Corsini (1301-1374), known as the “Apostle of Florence”, took his monastic vows here and later became bishop of Fiesole. Corsini was canonised in 1629, and several years later members of his family, one of the richest in Florence at that time, commissioned a chapel dedicated to him in the church. It was built in the Roman Baroque style and executed between 1675 and 1683. The Santa Maria was remodelled in the sixteenth century by Giorgio Vasari. The convent was also renovated, beginning with the first cloister between 1597 and 1612. Disaster struck in 1771, when most of the interior of the church was destroyed in a fire. Only the old sacristy, the aforementioned Corsini Chapel and the Brancacci Chapel were spared. The architect Giuseppe Ruggieri was subsequently hired to restore the church. The painters Giuseppe Romei and Domenico Stagi provided assistance. The result is a Late Baroque style church, which generally fails to make an impression on the visitor. From left to right: Masolino, Masaccio, Leon Battista Alberti and Filippo Brunelleschi. They can be found on the left wall, in the scene that shows The Raising of the Son of Theophilus and Saint Peter Enthroned. The main reason for being underwhelmed by the Baroque pomp of the church is the sheer beauty of the chapel. It was built in the late fourteenth century by Pietro Brancacci, a member of a wealthy Florentine family. The decision to have the chapel decorated on the inside can be traced back to one of Pietro’s relatives. In 1423, Felice Brancacci returned from a visit to the court of the Sultan of Egypt and hired the painters Masolino da Panicale (ca. 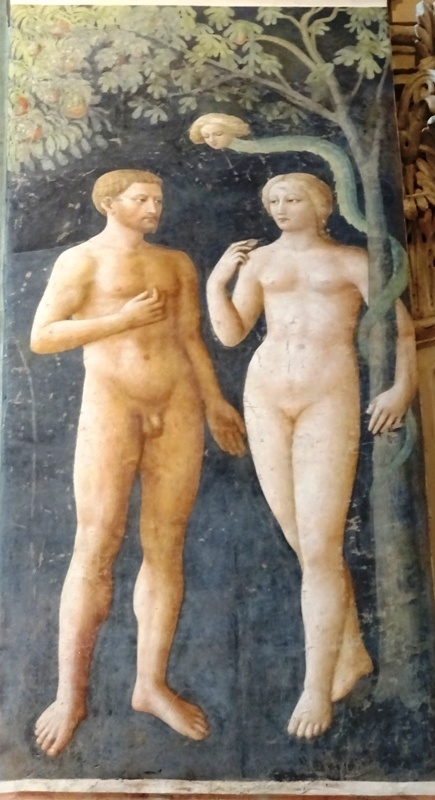 1383-after 1440) and Masaccio (1401-1428) to fresco the walls of the Brancacci Chapel. Both artists were actually named Tommaso. Masolino’s real name was Tommaso di Cristoforo Fini, and his nickname “Masolino” translates as “Little Tom”. Masaccio was born as Tommaso di ser Giovanni di Mone Cassai, and his nickname means something along the lines of “Messy Tom”. It has long been claimed that Masolino and Masaccio were master and pupil, but this is no longer accepted, at least not blindly. 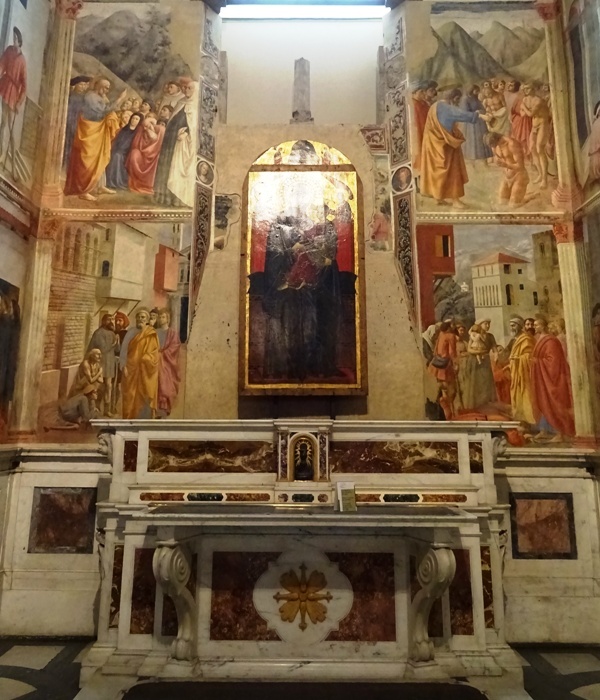 Masaccio had already independently painted a fresco for the convent of the Santa Maria del Carmine a few years previously, so he does not seem to have been under Masolino’s wings. This fresco – the Sagra – was regretfully destroyed when the convent was renovated at the end of the sixteenth century (see above). Back wall of the chapel. So Little Tom and Messy Tom set about decorating the walls of the Brancacci Chapel with their Stories of Saint Peter. It is usually assumed that they commenced their work in 1425. Masolino and Masaccio were unable to finish their work, because the former left for Hungary and the latter was called to Rome by Pope Martinus V (1417-1431). Martinus’ election had ended the so-called Great Western Schism (1378-1417), which had seen one pope ruling from Rome and another from Avignon. Occasionally, there had even been three popes. Now that the Catholic Church had been put back in order, Pope Martinus decided that Rome needed to become a beautiful city once again. While the arts flourished in cities like Florence, Rome was an underpopulated provincial backwater. The Pope therefore ordered Masaccio – whose fame was growing rapidly, even though he was still only in his twenties -, Gentile da Fabriano and Pisanello to come to Rome to work for him. Unfortunately for Pope Martinus, Da Fabriano died in 1427 and Masaccio in 1428, at the tender age of 27. Masolino apparently never returned to Florence to work on the chapel and it was left unfinished for years. The 1430s were a period of great turmoil in Florence. In 1433, Cosimo the Elder of the de’ Medici family, one of the most powerful bankers and politicians in the city, was exiled. The opposition against Cosimo had been led by political rivals such as Palla Strozzi from the equally powerful Strozzi family. When Cosimo was allowed to return to Florence just one year later, he took revenge on his enemies, who were in turn exiled. Left wall of the chapel. Felice Brancacci’s only fault happened to be that he was Palla Strozzi’s son-in-law. It was enough to be driven into exile as well. Felice never saw Florence again and died in the 1440s. The ban against his family would only be lifted in 1474. 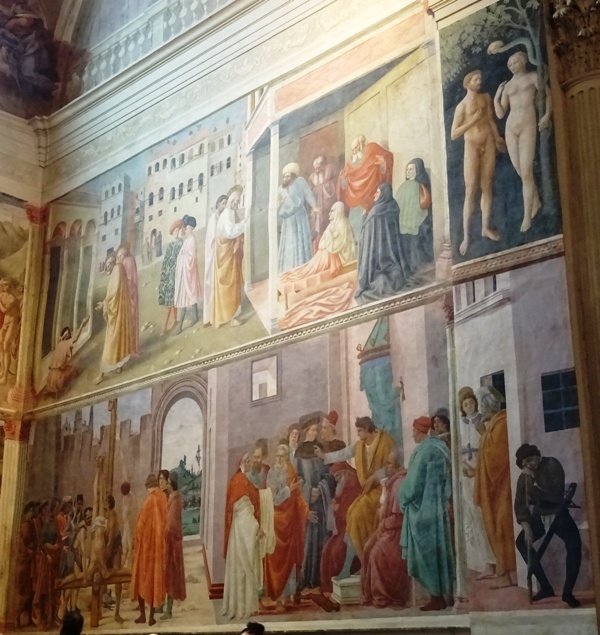 In the meantime, those parts of the frescoes showing members of the Brancacci family had been erased by the Carmelites and the chapel had been rededicated to the Madonna del Popolo in 1460. A thirteenth century panel painting of a Madonna and Child, which was executed around 1270 by an unknown artist and is sometimes attributed to Coppo di Marcovaldo (ca. 1225-1276), was placed above the altar. It can still be seen there today. Some years after the Brancacci family had been allowed to return from exile, work on the frescoes in the chapel was resumed. Filippino Lippi (1457-1504) was hired to complete the Stories of Saint Peter. His father Fra Filippo (1406-1469), also a celebrated painter, had been a Carmelite friar and was no doubt intimately familiar with the chapel in the Santa Maria del Carmine and its semi-completed frescoes. His son Filippino did a splendid job, completing between 1481 and 1483 an incomplete cycle of frescoes that had not been touched for over 50 years. Fortunately, the frescoes survived the terrible fire of 1771. They were thoroughly cleaned in the 1980s and nowadays their colours are just as magnificent as they must have been in 1483. Right wall of the chapel. Even though obviously there were differences in style between the three artists who worked on the frescoes, they seem to have maintained stylistic harmony. We can especially credit Lippi for this. 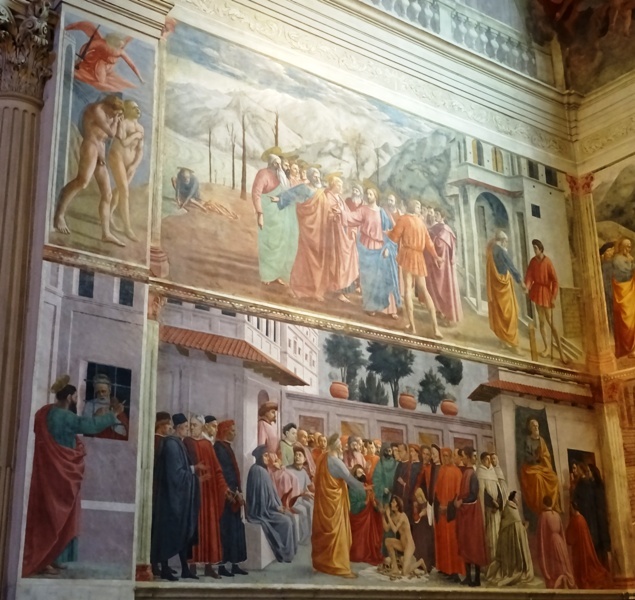 His predecessors Masolino and Masaccio worked closely together, but Lippi had to work on his own, decades later, and had to somehow stay close to the style of people who had died well before he was even born. The fresco cycle consists of twelve scenes, which I will briefly discuss. There were more scenes originally, but the frescoes in the lunettes and in the vault were destroyed during a “renovation” in the middle of the eighteenth century. The new Baroque vault fresco is a disappointment and does not match with the frescoes of the chapel, but it has a few trompe-l’oeuil elements which are amusing. 1. The Temptation of Adam and Eve by Masolino; a good example of the classical Late Gothic style of Masolino. Note that the snake has a human head. 2. The Expulsion from the Garden of Eden by Masaccio; this fresco is very famous, if only because of the tormented look on Eve’s face. Adam is hiding his head in shame. 3. The Tribute Money by Masaccio; a fresco so famous it even has its own Wikipedia page. The fresco is based on a story from Matthew 17:24-27, in which Jesus orders Peter to catch a fish and take a coin from its mouth, in order to pay a tax collector. The coin involved is a tetradrachm, which allows Peter to pay the temple tax – a didrachm per head – for both Jesus and himself. The fresco consists of three scenes. In the middle, the disciples led by Christ seem to be arguing with the tax collector. On the left, we see Peter at the lake, taking a coin from the fish. And finally, on the right, we see Peter paying the tax collector. 5. Baptism of the Neophytes by Masaccio; a neophyte is a new convert. 6. The Healing of the Cripple and the Raising of Tabitha by Masolino; the Raising of Tabitha refers to a story told in Acts 9:36-43. The story takes place in Joppa (present-day Jaffa), where a woman named Tabitha (or Dorcas) has just died. She was known for her good deeds and for giving alms to the poor, so she is deeply missed. Peter is called to go and see her, and by praying he manages to bring her back to life. The story of Peter healing a lame man can be found in Acts 3:1-10. Both scenes are set against a background of Florentine buildings. The level of detail is impressive. Note for instance the intricate patterns on the coat of the man in the middle, wearing a red turban. 7. The Distribution of Alms and the Death of Ananias by Masaccio; again a story from the Acts of the Apostles. It can be found in Acts 4:32-5:11. The young Christian community has decided to do away with private property. Everything is shared, land and houses are sold and the proceeds are brought to the apostles, who divide the money among the members of the community. A certain Ananias and his wife sell a piece of land, but keep part of the money for themselves. Peter discovers their deceit and severely harangues Ananias. Ananias then drops dead to the floor. 8. Saint Peter Healing the Sick with his Shadow by Masaccio; referred to in Acts 5:15, where it is said that “they brought forth the sick into the streets, and laid them on beds and couches, that at the least the shadow of Peter passing by might overshadow some of them” (AKJV). 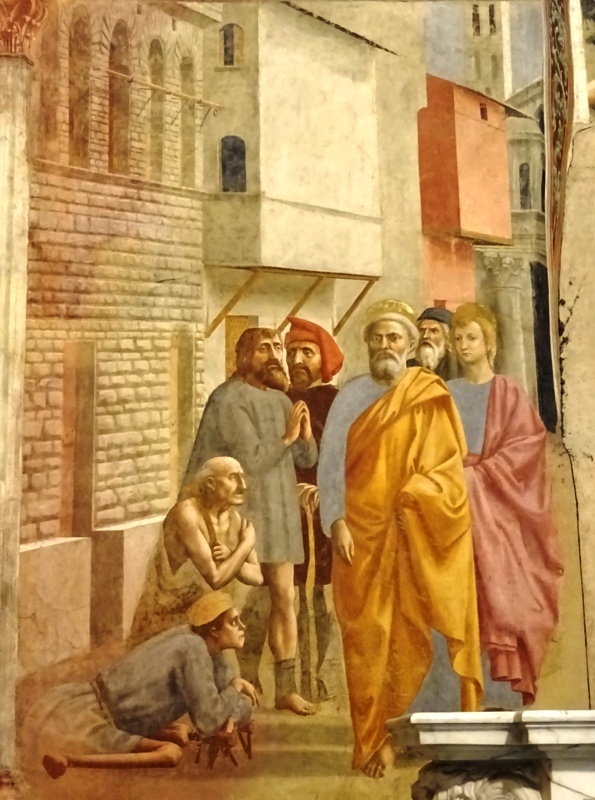 The man with the red hood may be Masolino, while the apostle John walking behind Peter may actually be Masaccio’s younger brother Giovanni. It has also been speculated that the sculptor Donatello is in the scene. 9. Saint Paul Visiting Saint Peter in Prison by Filippino Lippi; not a story from the Bible, but from the so-called Golden Legend (ca. 1260). Peter is imprisoned by Theophilus, prefect of Antioch, and is visited by Paul. 10. The Raising of the Son of Theophilus and Saint Peter Enthroned, begun by Masaccio, completed by Filippino Lippi; Paul convinces Theophilus that Peter can raise people from the dead. Quod erat demonstrandum. The prefect in the fresco has been identified as Gian Galeazzo Visconti, Duke of Milan (1351-1402). Visconti was a mortal enemy of Florence and is obviously the bad guy in the scene. 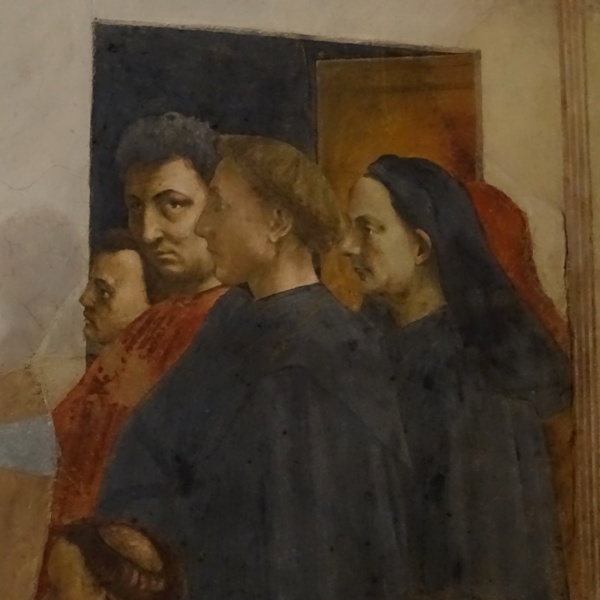 On the far right are Masolino (Little Tom indeed), Masaccio (looking at the viewer), Leon Battista Alberti and Filippo Brunelleschi (with the black hood), the man who built the famous dome of the Duomo. See above for a close-up of the four men. 11. Saint Peter Being Freed from Prison by Filippino Lippi; Peter is imprisoned by Herod, but God sends an angel to free him. The guards do not notice a thing. The story is told in Acts 12:1-11. 12. The Disputation of Saint Peter and Saint Paul with Simon Magus and the Crucifixion of Saint Peter by Filippino Lippi; Simon Magus is mentioned in Acts 8:9-24, but the story of a debate between Simon and the apostles Peter and Paul before the emperor Nero is actually from the apocryphal Acts of Peter and Paul (perhaps from the fourth century; see this post for more details). A self-portrait of Lippi can be seen on the far right. The scene on the left shows Peter being crucified, upside down as he himself had requested (he did not consider himself worthy to die in the same way as Jesus did; see this post). The story is mentioned in the apocryphal Acts of Peter (second century). In the fresco, we see three men standing to the right of the cross. One of them is looking at the viewer. He has been identified as the painter Sandro Botticelli (1445-1510). Make sure you do not miss the fresco of the Last Supper by Alessandro Allori (1535-1607). It can be found in the old refectory, where visitors can also watch a documentary about the Brancacci Chapel. Allori’s fresco was painted in 1582. The fresco is quite colourful, and only the bottom part is a bit damaged.